Welcome to another edition of Life on the Pamlico produced by the students of Beaufort County Community College. Our 2018 edition is focused on local arts. Because “arts” encompass a number of creative activities – dance, painting, pottery, theater, and much more – the students studied a wide variety of cultural arts that are connected to our area. In our research, we learned how the dirt beneath our feet hides the prevalence of clay in our state, and how whirligigs became popularized in our state via the urban legend of Acid Park in Wilson. Learning the origins of these arts and mediums helped prepare the students to interview, research, video, and write on a locale, person, or medium-associated local art that interested them. Life on the Pamlico is produced as a part of HUM 120 – Cultural Studies,which is offered on Beaufort County Community College’s campus each spring semester. As part of the course, students are taught in-depth research skills that aid them in producing the articles and videos for Life on the Pamlico. Students also receive some first-hand experience working with their research topics. This year’s class learned more about fiber arts by learning and practicing basic crochet stitches. When it came time to choose topics, each student writer focused on a unique art or artist local to northeastern North Carolina. Some arts, like drama, have a deep tradition in the local community, including the long-standing Turnage Theater in downtown Washington. Other students focused on the connection art and local culture and heritage. Still others found pleasure in writing about fun artistic activities, like the senior dances often held in Beaufort County. Each student’s contribution to this online magazine and our video achieves is preserving a small piece of the unique culture of our area. 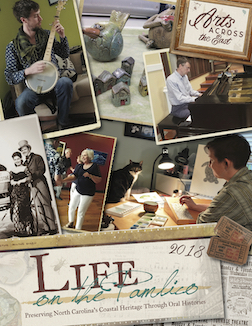 We hope you enjoy this year’s edition of Life on the Pamlico as much as we did working on the publication. Be sure to visit the archives for past digital issues, articles, and scans of early volumes of Life on the Pamlico.